For single and multiple fluorescence. Transform a bright field microscope into a unit capable of fluorescence. Dedicated vertical illuminators for Light Emitting Diode fluorescence. 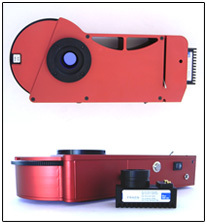 Universal illuminators for reflected light fluorescence with filter wheel technology. These all-round illuminators allow to transform a standard bright field microscope into a unit capable of fluorescence. Illumination is provided by interchangeable solid state sources (Light Emitting Diodes – LEDs). Available for 1, 2 and 3 color excitation. With adjustable light intensity, Different from other LED devices, FLUOLED® 1CFW and 3CFW do not require an existing epi-fluorescence illuminator mounted on the microscope. So fluorescence becomes available even on microscopes where original accessories are not commercialized any more.